In this guide, you will learn how to use the template editor to create simple templates, which can include text, images, tables or hyperlinks. At the top of your editor, you will find a toolbar that provides several different options. The Preview button opens your email message as a full page, in a new browser tab. This lets you see how your message might be displayed to recipients. The Print button takes you to your printing dialog box so that you can print your email message. Bold makes your text Bold. Italic Makes your text Italic. Adds a strikethrough to your text. Cut anything you have selected and place it in your computer’s clipboard. You can then paste anywhere else. Copy anything you select and make it available for pasting. The Paste button will paste any content that you have copied somewhere else, into your template editor. Paste as plain text will paste any text that you have cut or copied somewhere else, but without maintaining its formatting. Paste from Word - Use this button when you are pasting text from Microsoft Word and want to maintain the formatting. Please note that you cannot past images using this button - You will need to upload them separately. Redo an action that you have previously undone. Replace allows you to find text within your template and replace it with some other text. Select All will select the full message body. You can place your cursor into the editor, then press CTRL+A or Command+A to achieve the same result. Check spelling throughout your entire template. Use this button to insert a table into your template. Insert or remove a numbered list. Insert or remove a bulleted list. Decrease the indent of your paragraphs, tables or images. Increase the indent of your paragraphs, tables or images. The Alignment buttons allow you to align your paragraphs, tables or images to the Left, Center and Right, or to Justify so that the text on your right side is arranged in a straight line. The Styles dropdown is where you can add different styling features to your text. This is where you can set your main titles, subtitles and other elements, so that they match throughout your template, preventing for example situations when you have main titles in different fonts, font sizes, etc. Use the Format dropdown to apply heading formatting to your template. Use the Font and Font Size dropdowns to select the font that you would like to apply to your text; as well as the size you want to set it to. Insert a link by selecting your desired text and adding a clickable URL. You can link a block of text to a web address, an email address or an anchor within your template. The Unlink button removes a URL from the selected text. Set the selected text as an anchor so you can then link to it. Anchor text will have a flag next to it and will be highlighted in blue. 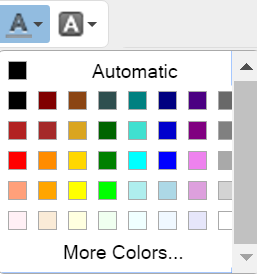 The Color Pallets allow you to change the color of your text or of the background behind the piece of text you’ve selected. The Source button takes you to the HTML view of your template. You can edit the HTML source code using this view. The image button allows you to upload images to your template.